Mark L. Haas. 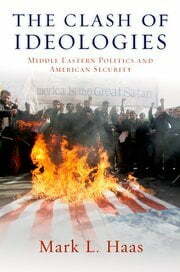 The Clash of Ideologies: Middle Eastern Politics and American Security. Oxford: Oxford University Press, 2012. ISBN 978-0-19-983844-8 (paperback, $29.95). I review the book in four parts. First, I summarize Haas’ central arguments. Second, I explain their theoretical appeal. Third, I critique Haas’ method for comparing his argument to realist alternatives. Fourth, I review his empirical findings, showing where his theory generates profound insight and where I believe his interpretations reach beyond what the evidence will bear. Although my criticisms are primarily realist in nature, my conclusions are favorable: Haas has a lucid theory of ideology with real empirical heft. At its best, The Clash of Ideologies presents a synthetic social science theory that integrates realist and ideological forces. As a field, international relations would do well to build on such work. For Haas, the content of ideologies is less important than the differences between them. International actors who share similar domestic legitimating principles will tend to trust and cooperate with each other, whereas ideologically distant regimes will regard one another with fear and hostility. This is because ideologies play a crucial role in helping actors interpret each other’s intentions in a world of ambiguous information. Such clarifying dynamics apply across all kinds of ideologies: liberals and illiberals will regard each other with suspicion, but so will different kinds of illiberals, like communists and fascists, or secular and religious authoritarians. Ideological competition also matters because it produces demonstration effects. Leaders worry that the success of their ideological enemies abroad rallies support to opponents at home, and they celebrate the success of their ideological confederates in other countries with an eye towards their own domestic position. For these reasons, statesmen will both fear outside subversion from their ideological enemies and seek to promote their own ideology in other states. From these mechanisms, Haas generates three core predictions. First, ideologically distant states ought to perceive each other’s intentions as hostile and engage in more aggressive behavior towards each other, and vice-versa. Second, states will be inclined towards regime promotion in ideologically distant states as a method of improving both their international and domestic security. Third, states will have strong disincentives towards cross-ideological alliances: birds of an ideological feather will flock together, while different species will fly apart. However, Haas also theorizes that that the ideological polarity of the system—whether there are two competing ideologies, or many—will mediate the effects of ideological distance. In an ideologically multipolar world, there is likely to be more cross-ideological alignment: ideologically distant states can find common ideological enemies abroad, even when they otherwise distrust each other. Cooperation can ensue without damaging their ideological brethren and ideological gains can be pursued at the expense of a third worldview. Foreign alliances can supply or free up resources to use in domestic competition, and such unions are more likely when both partners detest ideological third parties. In short, when two ideologies square off against each other, we should expect distrust and hostility, but a world of several competing philosophies introduces the possibility of overcoming the natural centrifugal forces of ideological distance. Haas has built an impressive theoretical edifice, with much in it to admire. The mechanisms he suggests for the impact of ideology are both logically consistent and intuitively plausible. Indeed, the theory chapter is sprinkled with a host of examples and quotations that reinforce the ideological distance approach. British Prime Minister Neville Chamberlin wrote to his sister about his distrust of Soviet motives because of Russia’s distance from ideas of liberty—in March 1939! Thinkers from William Pitt the Elder to John F. Kennedy stressed the critical importance of promoting their ideology abroad. The reader has a difficult time resisting the thought that ideological distance must matter, at least somewhat, for the reasons Haas has suggested. Haas’ theory improves on some of the failings of previous attempts to grapple with ideology. His focus on both the domestic and international implications of ideology is welcome. If leaders are ideologically motivated, it follows that they will not easily recognize national boundaries in their thinking: the ‘right’ outcomes should matter everywhere, and the interaction between international and domestic events will be a central concern. Furthermore, the move from ‘ideological content’ to ideological distance makes the theory more generalizeable—this is not simply a theory about any particular set of legitimating principles. So Haas has at once made his picture of ideology more realistic, by expanding the political frame of reference for ideological content, and more widely applicable, by making the theory itself content independent. Haas also gamely tries to defend against some classic criticisms of ideology in world politics. The move to ideological distance partially de-fangs the complaint that decision-makers do not act in accordance with the content of their ideology. So, while the United States may support authoritarian dictators, contrary to American liberalism’s content, it generally does so because it fears an ideologically worse outcome: totalitarian states. Similarly, realists often point to the existence of cross-ideological alignment as a critical blow to ideological theories. Here, Haas’ introduction of ideological polarity is a progressive innovation. By pointing to ideological circumstances that make such alignments more likely, Haas cedes some ground to realism while establishing a baseline effect for worldviews. In this vein, the biggest contribution of The Clash of Ideologies is to lay the groundwork for a realist-constructivist synthesis. The theory’s general shape, with its focus on state reaction to threats and the polarity of the system, mimics the logic of realist theories. In Haas’ world, states still compete for relative power and are seriously concerned with strategies for pursuing it. At the same time, ideological distance theory gives us a somewhat different set of expectations for the pattern of basically realist behaviors than a purely materialist alternative would suggest. At points in the book, Haas takes exactly this kind of synthetic approach. He suggests that both power and ideology are subject to threshold effects. For instance, relative power differentials usually need to be high to overcome countervailing ideological forces; it often takes the pressure of war to push ideological enemies together. At the same time, if power differentials are too high it is less likely that states will even notice an ideological threat—regime change in Micronesia bothers no one. And as Haas notes at one point, the structure of power will deeply shape ideologically-motivated behaviors: “foreign policy outcomes may be pragmatic because relative power considerations dictate that they be so. International preferences and perceptions, by contrast, may be ideologically based.” (49, emphasis in the original.) In short, Haas’ theoretical framework makes a determined effort to integrate ideas and power, an enterprise that is to be applauded. Nevertheless, Haas is also clearly resistant, at times, to a synthetic enterprise. Haas spends much of his effort trying to demonstrate that ideological distance does a better job than power political theories of explaining state behavior. Here he is less successful. One of Haas’ central predictions for realist theories is a straw man. He argues that if balance of power theories are true, we should not see “systematic, substantial differences in foreign policy perceptions and strategies” among different groups within a state. After all, he argues, because similarly situated groups are receiving the same information from the system, they should come to the same conclusions. This move reduces balance of power theories to a crude rational unitary actor caricature. Of course different actors within a state will perceive matters differently; human beings are not automatons. The crucial question is: what will the leaders in power do at the critical moments of policy decision? Statesmen can sometimes hold genuine ideological beliefs that change upon confrontation with power realities. Trotsky’s communist view that as People’s Commissar for Foreign Affairs he would ‘issue some revolutionary proclamations to the peoples and then close up the joint’ quickly gave way to his need to steer Soviet foreign policy. Alternatively, political actors often use foreign policy instrumentally to gain power. Dwight D. Eisenhower ran for President in 1952 on a rollback platform, but adopted a very different policy in office. Balance of power theory predicts only that the policy choices of actual decision-makers will track changes in the power distribution in the appropriate ways (a prediction Haas does correctly deduce). Pointing out the existence of different views within a state, or even within a government, proves very little; changes in policy are what count. A final problem is that Haas is never clear about ‘how much’ foreign policy should move in response to a given ideological or realist change. All alliances are not equal; attempts at regime promotion can be more or less intense; hostile or cooperative relations vary in degree. When should we expect large changes, and when should we expect small changes? Haas never says, but his evidence suggests that movement in geopolitical variables causes far larger changes in foreign policy than does ideological movement. Haas tests his theory against evidence in Iran, Syria, Turkey, and Saudi Arabia. He concedes that geopolitical explanations do very well in explaining the Saudi-U.S. alliance, so I do not address this case here. Post-Cold War Turkey is undoubtedly Haas’ best case. He very convincingly delineates the ideological divides among Turkish parties. Roughly, the seven major parties vary in their dedication to liberal principles of democracy, free-markets, and individual rights and in their dedication to the Kemalist principles of secular Turkish nationalism. The Kemalist and conservative (liberal) parties were hostile to Iran, which they saw as an Islamic state bent on subverting Turkey’s secular nationalist constitution through its support of Turkey’s Islamist and Kurdish dissidents. These parties also favored stronger ties with Israel, who “the Turkish foreign policy elite had long viewed as being ‘like us.’”(196) As Haas demonstrates, these parties caused a series of crises with Iran and also achieved significant security and economic cooperation with Israel. In stark contrast, the Islamist Welfare Party (WP) caused a sharp break in Turkish strategy during its brief time in power. Perceiving Iran as model for an Islamic society, the WP immediately signed significant export deals with Iran and agreed to mutual security cooperation to deal with cross-border Kurdish terrorism. The WP’s leader, Necmettin Erbakan, founded a ‘Muslim Common Market’ with Iran and six other Muslim majority countries, which he hoped would launch a new bloc of political and economic cooperation akin to the EU. Erbakan also denounced Israel in strident terms, and accepted old agreements at the military’s insistence. While the WP was in power its coalition partners consistently sought to undermine its foreign policy, and ultimately, the military deposed it by force. The Justice and Development Party (JDP), in power since 2002, also provides support for Haas’ case. The JDP occupies an ideologically orthogonal position in Turkish politics: it is simultaneously the most politically liberal of the major parties, while also advocating for a strongly Islamic civil society. Haas argues that the JDP is therefore ideologically closer to the major actors in the Middle East than most of the other Turkish parties. Hence, the JDP has had fairly cordial relations with Iran, whose Islamic society it admires, despite its opposition to Tehran’s theocratic politics. This relationship fared well in the 2000s, though a realist might have expected Iran’s burgeoning nuclear program to have the opposite effect. JDP cooperation included non-trivial economic agreements, intelligence sharing and military contacts on Kurdish guerillas, and importantly, opposition to UN sanctions on Iran’s nuclear program. At the same time, the JDP has been willing to cooperate with Israel, but also to sanction it for its abuses of Muslim rights in Palestine—even though Turkish cooperation with Israel stems in part from geopolitical incentives. The JDP’s liberalism has made it Brussels’ preferred diplomatic partner, prompting a reversal of long-standing pro-EU sentiments among the Kemalist parties. The JDP has also been very interested in spreading liberal regime types in the Middle East, strongly supporting democratization efforts and giving material and diplomatic support to opposition movements in the Arab Spring. A few minor discrepancies aside, Turkish politics powerfully confirms Haas’ theoretical expectations. Haas’ argument does less well in Iran, although there is still some modest support for ideological distance theory in the case. Again, his analysis persuades that there is indeed an ideological split in Iranian politics, between a more reformist and liberal set of Islamists and the conservative theocratic establishment. The former clearly have friendlier perceptions of the United States because of their more liberal-minded views, while the latter are unremittingly hostile. And indeed, when reformers gained a bit of power in 1997, there was a minor improvement in U.S.-Iranian relations. Reformers apologized for the embassy kidnappings during the 1979 Iranian revolution, and promised they were not going to kill Salomon Rushdie. Iranian diplomats made stern sounding remarks about terrorism, and perhaps got the IRGC to sponsor a little bit less of it. The Iranian navy apparently took a more polite tone over marine radio with its American counterparts. These and other small gestures are not trivial, but they seem like pretty weak tea. In contrast, Haas’ evidence shows that geopolitical factors drove the major movements in U.S.-Iranian relations after the Cold War. Specifically, after the September 11, 2001 attacks, the United States simultaneously destroyed two of Tehran’s biggest enemies and put hundreds of thousands of American troops to both its East and West. Three of Stephen Walt’s ‘threat’ indicators—distance, offensive capability, and aggressive actions—were reading off the charts, even as Tehran’s geopolitical interests were getting a major boost. Unsurprisingly, at this point Tehran offered extensive cooperation. Iran militarily, economically, and politically facilitated American operations in Afghanistan, and at least initially held off from harassing American forces in Iraq. Instead, in 2003 Iran offered a much remarked upon ‘grand bargain.’ In return for peaceful access to nuclear technology and an end to sanctions, Tehran promised the abdication of its nuclear program and complete transparency regarding nuclear facilities; complete cessation of support for terrorism including pressure on Hizbollah in Lebanon; support for the Israeli-Palestinian peace process and for Iraqi democracy; and full cooperation against Al-Qaida. Iran further began two years of cooperation on nuclear issues, including a suspension of uranium enrichment. Previous to 9/11, even the reformers had accelerated the nuclear program; after 9/11, even Iranian conservatives acquiesced in a remarkable about face. Of course, the Bush administration torpedoed these overtures, and by 2005 it was obvious that American power was bogged down in an Iraqi quagmire. The natural return to balancing behavior on the part of Iran—its support for Iraqi Shia militias and a decision to move ahead with the nuclear program—does not seem to require an ideological explanation. Haas’ attempt to provide one, in the form of earlier conservative attempts to sabotage good relations with the United States, is not convincing. He makes it clear that the conservative Iranian establishment was divided after 9/11, especially on nuclear issues. A new conformity of conservative opinion, the reformers’ loss of power, the deterioration of the situation in Iraq, and the change in Iran’s foreign policy all happened simultaneously. It is not obvious which variables were causing what in 2005; but given that geopolitics was driving events beforehand, realism looks like a fair bet. Haas’ chapter on the Iranian-Syrian alliance is perhaps the most intriguing and the most disappointing in the book. Haas tracks the waxing and waning of relations between this odd couple from 1979 to the present day, using it as a test of his propositions about ideological multipolarity. Condensed, his story is that the coming of the Iranian revolution spurred cooperation between Syria and Iran because they now shared a common ideological enemy in Israel. This cooperation pre-dated the Iran-Iraq war, and intensified in 1982, well into its course, largely because Syria needed Iranian resources to suppress the Muslim brotherhood at home and to harass Israel’s threatening position in Lebanon. The alliance then fell into disarray in the late 1980s as Syria and Iran differed over their ideological goals for Lebanon, and was nearly extinguished by a Syrian ideological change that favored a negotiated peace with Israel. It took the coming to power of ideologically hard-line regimes in Tel-Aviv and Washington to resuscitate the alliance in the 2000s. On its face this appears to be an appealing ideological story, but a closer look reveals some problems. Prior to the Iranian revolution, conservative secular authoritarians ran both Syria and Iran. Each country shared interests in opposing Iraq and a common ideological antipathy to the Iraqi Baath Party (though the feelings of the Syrian Baath run contrary to the trend Haas expects, as he admits, 127). By Haas’ logic, there is excellent reason to expect an alliance, or at least close cooperation, between the ideologically simpatico dictators. Yet no such cooperation occurred. An untested hypothesis explaining this outcome is that the Shah’s Iran was a major American client state, while Syria was supported by the Soviets. So the Iranian revolution, although providing Iran with ideologically anti-Israeli goals, also removed an enormous geopolitical impediment to Syrian-Iranian cooperation. In any event, the initial cooperation between Syria and Iran amounted to very little: some promises exchanged and a few symbolic Iranian troops sent to stand guard outside the Golan Heights with their Syrian brothers. Indeed, the very fact that there was no significant cooperation in the early phase of the Iran-Iraq war shows how tenuous these ties really were; Syria’s immediate interest was in not getting caught on the wrong side of a decisive victory in the war, rather than bolstering anti-Zionist ideological revisionism. Syria’s long-term geopolitical interests were very well-suited to stalemate, which may have been a permissive factor allowing increased cooperation after 1982 that facilitated such an outcome: Syria provided phosphate shipments and weapons to Iran, as well as cutting off Iraqi oil pipelines, making Saddam Hussein’s financial problems multiply. Iran, for its part, gave Syria $400,000,000 worth of oil and oil related concessions. Haas attributes tighter cooperation to the incentives of ideological multipolarity—Syria desperately needed resources to fight the Muslim Brotherhood at home, a group the Shia revolution in Iran despised for its own ideological reasons. But it is not clear that ideology has much to do with any of this. For one thing, the ideological distance between Shia and Sunni Islamists seems to vary across the Middle East. According to Haas, Turkish Sunni Islamists get on quite well with Iranian fundamentalists; and the Tehran regime has been a sympathetic partner to Sunni Islamists in the Palestinian territories. At the same time, despite the “aberration” (136) of the Syrian Muslim Brotherhood initially welcoming the Iranian revolution, apparently Sunni Islamists in Syria do not jive with their Shia counterparts in Tehran. A simpler hypothesis is that any Iranian regime would have welcomed arms and financial pressure on its enemy as it fought a bloody stalemated war, and Syria would have welcomed resources to fight any kind of domestic opposition. Haas is on firmer ground in his analysis of Syrian and Iranian cooperation in Lebanon. He admits that Syrian motives were essentially geopolitical: to remove Israel’s threatening presence from Syria’s border; prevent the establishment of an anti-Syrian state in Lebanon; and to use Lebanese militias as a pressure point for getting back the Golan Heights. Iran’s motives, on the other hand, were ideological: Lebanon was an anti-Zionist weapon and an opportunity to spread the Iranian revolution. Naturally, when these motives ran up against each other, the alliance began to fray. Syria had no interest in a fundamentalist state springing up next-door, and after American and Israeli withdrawal from Lebanon in 1984-1985, Syrian and Iranian sponsored militias fought proxy wars with their respective patrons’ support. The second cause of the alliance’s descent was Syria’s apostasy through participation in the peace process. With Damascus suddenly eager to strike a deal with Israel, Haas finds that in 1992 there was “an explicit switch ‘in Syria’s view of the conflict from an existential one to a territorial one and a de facto separation of the Israeli-Syrian dispute from the Palestinian issue.’” (143) Perhaps. But Haas’ characterization of Syrian goals towards Israel as ideologically motivated seems weak. If Syrian President Hafiz Al-Asad harbored dreams of eliminating the Zionist regime before the collapse of the Soviet Union, he did not let them affect his policy much, which appears to have been driven by a desire to regain the Golan and run of the mill Syrian nationalism. It is just as likely that the explosion of Asad’s Cold War patron convinced him that his unyielding line was played out, and that only a new approach could win back lost territory. Similarly, it does not require any ideological variables to explain the resurrection of the Syrian-Iranian alliance. Neither the Benjamin Netanyahu nor George W. Bush governments were interested in a peace settlement over the Golan, which made turning back to Tehran more appealing. Furthermore, after the United States invaded Iraq and put the cross hairs on Damascus and Tehran as well, Syria faced the same incentives towards cooperation and balancing that Iran faced. Like Iran, it responded with cooperation at first, followed quickly by support for the insurgency in Iraq. Haas is right to emphasize that Syria’s opposition to the United States was more ambivalent than Iran’s because of its domestic Islamist problem. The bulk of Syrian policy during the period, though, seems perfectly consistent with geopolitical explanations. The Clash of Ideologies is a theoretically important and empirically useful study. Indeed, the criticisms I have made of it are possible only because of Haas’ explicit logic and scrupulous presentation of evidence. The book would have been improved by a more thorough attempt to examine balance of power explanations for its data, which I believe would have explained a considerable amount of evidence. But this is not the same thing as saying that a single realist alternative could explain all of the anomalies I have highlighted. Indeed, the great triumph of the book is that it often integrates ideological and realist variables to explain phenomena that neither can account for alone. The Clash of Ideologies is a success in its own right and represents a route towards progress for future scholars. Brendan Rittenhouse Green is the Stanley Kaplan Post-doctoral Fellow in Political Science and Leadership Studies at Williams College. He studies international security issues and earned his Ph.D. in political science from the Massachusetts Institute of Technology in 2011. He is the co-editor and co-author of U.S. Military Innovation after the Cold War: Creation without Destruction (Routledge, 2009), and his work has recently appeared in International Security and The National Interest. He is ideologically dedicated to awful sports teams, like the Cleveland Indians and Cincinnati Bengals, and judges the intentions of more successful sports fans with fear and hostility. Previous work by Haas and Owen includes Mark L. Haas, The Ideological Origins of Great Power Politics, 1789-1989 (Ithaca, NY: Cornell University Press, 2005); John M. Owen, Liberal Peace, Liberal War: American Politics and International Security (Ithaca, N.Y.: Cornell University Press, 2000); John M. Owen, The Clash of Ideas in World Politics: Transnational Networks, States, and Regime Change, 1510-2010 (Princeton, NJ: Princeton University Press, 2010). The effect of ideology on intentions derives from social identity theory and in-group/out-group dynamics. Haas emphasizes this point in earlier work: Haas, The Ideological Origins of Great Power Politics, 1789-1989, 9–12. Haas also introduces a novel theoretical argument about the effectiveness of hard and soft-line policies. Though interesting, his propositions on this score seem to me only loosely connected with his broader theory, and I omit a treatment of them here. Haas is by no means alone in this error. Many scholars who seek to push geopolitical variables out of the way for their own domestic theories make a similar argument: see Kevin Narizny, The Political Economy of Grand Strategy (Ithaca, NY: Cornell University Press, 2007); Brian C. Rathbun, Trust in International Cooperation: International Security Institutions, Domestic Politics and American Multilateralism (Cambridge: Cambridge University Press, 2012); Owen, Liberal Peace, Liberal War: American Politics and International Security. The argument is not improved by its ubiquity. This is not to say that threat perceptions do not matter, or should not count as evidence. They simply need to be closely connected to the policy choices states make; there mere existence of divergent viewpoints does not undermine balance of power theories. Walt’s classic works on alliance formation and threat, which serves as a foil for Haas’ own approach, are Stephen M. Walt, The Origins of Alliances (Ithaca, NY: Cornell University Press, 1987); Stephen M. Walt, Revolution and War, Cornell Studies in Security Affairs (Ithaca, NY: Cornell University Press, 1996).